Eso Panch Namokaro, Savva Pavappanasano, Mangalanam Savvesim, Padhamam Havai Mangalam. Meaning: I bow in reverence to Arihants, to Siddhas, to Acharyas, to Upadhyayas, to all the Saddhus. This five fold salutation destroys all sins. And amongst all auspicious things is the most auspicious one. 3 MEDICINE BUDDHA MANTRA: TAYATHA OM BEKANDZE BEKANDZE MAHABEKANDZE RANDZA SAMUDGATE SOHA. Powerful mantra to invoke the Blue Medicine Buddha of Healing. Meaning: Buddha of Infinite Light and Radiance. Amitabha is of great important in far-eastern Buddhism, where he is known as Amida. He also has a Bodhisattva form called Amitayus, which means “Infinite Life. He is a buddha of infinite love, infinite light, and compassion. 5. TARA MANTRA: OM TARE TU TARE TURE SOHA: Meaning:: Essence of Awakend Mind/Body, quickly with boldness, clear away all fear, distress, and suffering of all beings, complete victory of truth over all negativity, and all accomplishments. 6. VAJARASATTVA MANTRA: Vajrasattva (Vajra Hero, Tib. dorje sempa) "Dorsem" is the Buddha of purification. As the "action" or karma protector, he also manifests the energies of all Buddhas. His face is gentle, and luminescent. The whole radiates as a rainbow. You, Vajrasattva, have generated the holy mind (bodhicitta) according to your pledge (samaya). Your holy mind is enriched with the simultaneous holy actions of releasing transmigratory beings from samsara (the circling, suffering aggregates). Whatever happens in my life—happiness or suffering, good or bad —with a pleased, holy mind, never give up but please guide me. Please stabilize all happiness, including the happiness of the upper realms, actualize all actions and sublime and common realizations, and please make the glory of the five wisdoms abide in my heart. Rangsem chokur ngon sum ton dzey pa, Tsawei lama shab la solwa deb”. Meaning: “From within the mansion of enlightened awareness, the highest heaven, we pray to our very source of guidance and blessings, the essetial embodiment of all the Buddhas of the past, present, and future who reveals our own awareness of Dharmakaya (Ultimate) Reality.” This song has the actual sounds of Uranus, Rings of Saturn, and Earth recorded by NASA.. It is my wholehearted wish that everyone who experiences these sacred musical transmissions & mantras will benefit infinitely from their healing, empowering and clearing potency. May this align you to Source, your greater, higher Self, Inner Guides, & Ascended Masters, lifting you into an Enlightened State of Being and Living. May you share this bliss with others to assist them in their journey of awakening. 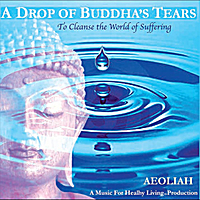 This is another Masterpiece from Aeoliah, each of the 7 tracks contains powerful healing mantras and sound frequencies relating to various aspects of our life., with information provided for each track. Just simply listening with headphones on I could feel shifts taking place in my body and was buzzing with a feeling of well-being for a long time afterwards, highly recommended. I just love the chimes, synths, and cool sounds on this album! A must buy.